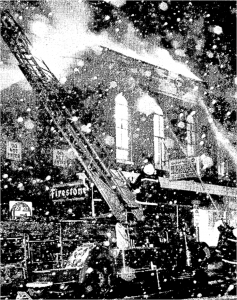 Three firms on the ground floor-Quinn’s Floor Service, Frostburg Antiques, and Fair’s storeroom, along with an apartment occupied by Stephen Bender, were destroyed. The Knights of Columbus occupied the second floor of the building with a dance room in the front of the building and a barroom in the rear. Because of dense smoke and false ceilings, firemen could not find the fire when they arrived at the scene and entered Fairs storeroom, according to John Charles Durst, Frostburg Fire Chief. The building, one of the oldest in Frostburg, contained the false ceilings, and hallways which had been closed after remodeling. Woodchips placed in the floor for insulation purposes, also contributed to the blaze. Fire officials had not determined this morning whether the fire started in the basement or the main floor. Oil, and related automobile supplies stacked in affairs storeroom posed a potential danger to firemen, and for a while firemen had to leave because of the volatile nature of the stored supplies. Quinn’s Floor Service also reportedly contained final floor coverings, and carpets, all of which were highly inflammable. The fire was contained in the adjoining Sweitzer’s bar and apartment since firemen had anticipated the spread of the flames and had taken precautionary measures, which kept damage there to a minimum. Chief Durst was overcome with smoke and taken to Frostburg Community Hospital by the Hafer-Sowers Ambulance, where he was treated and released. Michael Williams, a Frostburg firefighter, injured his shoulder when he fell in the rear of the building, and he was treated and released at Frostburg hospital. Another casualty of the fire, Geo. Milholland, of LaVale, was also treated and released for smoke inhalation. Firemen from Frostburg, Clarysville, Midland, Shaft, Eastern Garrett County, and LaVale rescue personnel ringed the building with equipment. A strong wind and temperatures at the freezing mark hampered firemen, it was reported. Paint cans stored on the ground floor reportedly exploded despite the water which was hosed on the fire. The building was owned by the Knights of Columbus. The organization spent about $14,000 reportedly on remodeling two years ago. Jim Quinn of Quinn’s Floor Service, said he was in business 38 years and had the largest inventory ever, all of which was destroyed. Frostburg antiques, owned and operated by Ronald Faust, had just been inventoried before the blaze. The apartment above Sweitzer’s bar was occupied by Charles Grant, who lives alone, while Stephen Bender whose apartment was in the rear of Fairs storeroom, lost everything in the fire. All of Frostburg’s fire equipment was at the scene of the blaze, which is the third major fire at Frostburg in three years. Part of the business section was destroyed by fire January 13, 1973, and two persons lost their lives in a January 8, 1974 home fire in that community. It was expected that fire officials would continue to probe the gutted building today in an effort to determine the origin of the blaze.